by Andersen, Roy, Seibert, Robert F., Wagner, Jon G.
Comments: Acceptable condition. Former Library book. 6th edition. Andersen, Roy, Seibert, Robert F., Wagner, Jon G.
For junior/senior-level courses in Middle Eastern Politics and Comparative Politics. Using a multidisciplinary approach, this text presents the politics of the Middle East by integrating the economic, historical, social science, popular culture, and religious issues of the area. 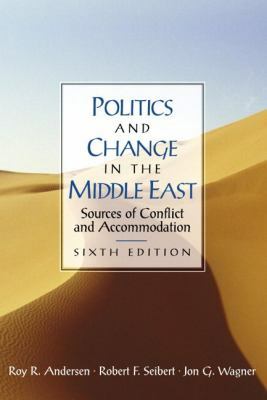 It incorporates historical perspectives with contemporary material, giving students the necessary background to make informed judgments on the politics of the region today.Andersen, Roy is the author of 'Politics and Change in the Middle East Sources of Conflict and Accommodation' with ISBN 9780130260093 and ISBN 0130260096.